A FOUR star Lake District hotel is encouraging guests to Pack a Pigling Bland when they go on their travels. Lindeth Howe Country House Hotel in Bowness-on-Windermere is celebrating the 100th anniversary of The Tale of Pigling Bland, which author Beatrix Potter wrote and illustrated from Lindeth Howe, with a special fundraising activity. 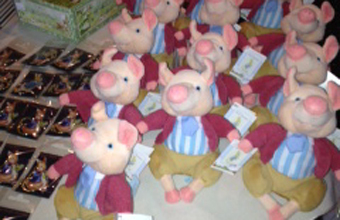 Everyone who buys a Pigling Bland toy and takes it on their travels will be able to raise a 1p per mile travelled for Lake District conservation work. All the mileage will be totted up, converted into a monetary sum and donated to Cumbria-based responsible tourism organisation, Nurture Lakeland. General manager Alison Magee-Barker said: "We already have people raising money for conservation with their Pigling Bland. If guests or non-resident diners buy one during their Lakes summer holiday and then take him home with them, we could raise a whole lot more."